Arduino allows new non-arduino hardware to be installed to the arduino ex folder or to the arduino sketchbook folder. Adding new hardware cores and libraries to your "Sketch Book Folder" is probably the best way to work because it means that you don't have to re-install the new hardware each time you upgrade to a new Arduino IDE. For the purposes of this demonstration we are using "avr-netino". The image below shows a successful compile of the 4 example projects in the avr-netino-19Jan2012.zip on google code. I am currently running Visual Studio and arduino 1.0.1, but I think it will work the same for arduino 1.0. These are the steps I made to install this new hardware and associated files. 1) Copy the contents of the "Hardware" folder to your "[Sketch Book Folder]\Hardware" folder. 2) Copy the contents of the "Libraries" folder to "[Sketch Book Folder]\Libraries"
Nb: Create the Libraries folder if it does not exist. 3) Copy the "avr-netino" folder from the "examples" in the zip to the sketch book folder. The location of your sketch book folder can be found in the Arduino ide "File>Preferences" window or by selecting "File>Open Arduino File" in Visual Studio. My sketch book folder is "My Documents\Arduino"
Re-start Visual Studio and you should see the new hardware on the boards list. 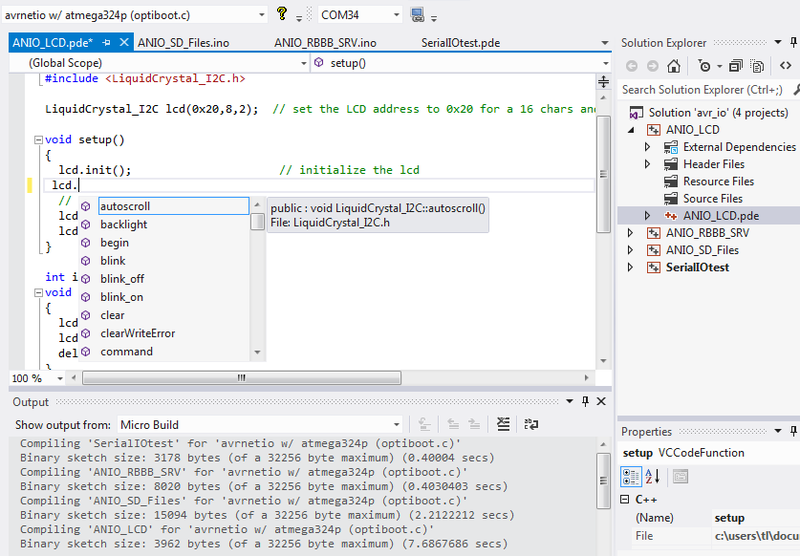 Both Visual Studio and Arduino should compile correctly with this configuration.